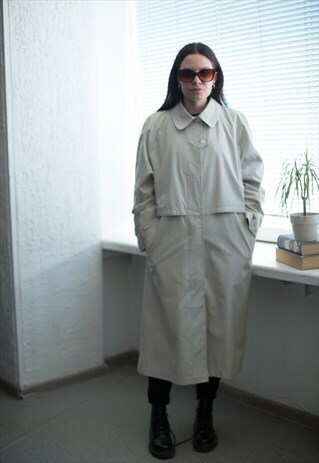 Vintage 80's beige trench coat with two pockets on the front and few small pockets inside. UK size not written but looks flexible like 6-8. Model size on the photo is 6. Measurements: length 43 inches, sleeve 24 inches, chest 43 inches, waist 44 inches, hips 45 inches. Attention: there are small invisible stretches around button (last photo).